WHY GO: If dogs had a Travel Bucket List, Alexandria VA would certainly be among the Top Five Towns For a Tail-Wagging Good Time. 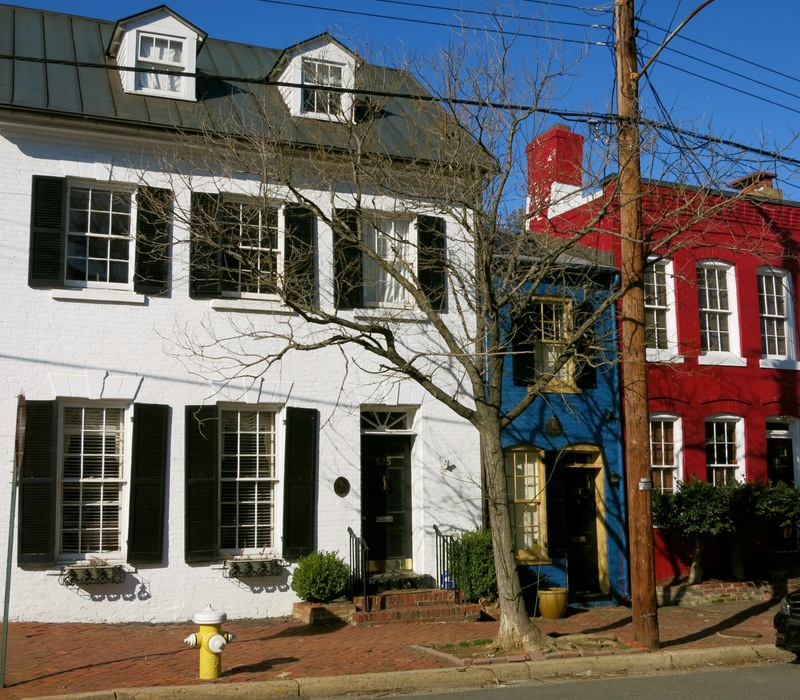 Right across the Potomac River from Washington DC, Old Town Alexandria – a boutique-studded favorite of Presidents and common folk since Colonial days – is the perfect quiet alternative to bedding down in our nation’s capitol. And now, there’s a better reason to visit: Civil War Medicine practiced in Alexandria inspired the hit PBS show, Mercy Street. To find out how to do it right, keep reading. 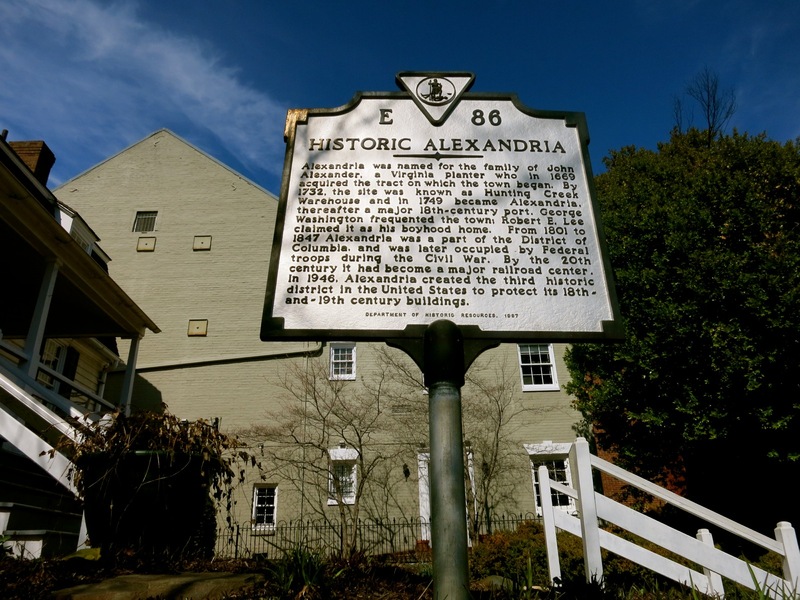 DO: Stop in at the Alexandria Visitor’s Center. You’ll find a slew of information including a self-guided Brewery Walking Tour, a Boutique District Guide, city guides, tickets, and discount coupons. Purchase a Key to the City Pass, which provides access to nine attractions in Alexandria for just $10 (a $26 value). Open 10am-8pm daily, free. WALK/TROLLEY: King Street. A Metro Stop sits at the head of King St., the Potomac River at the foot – and a free trolley runs its length. This is perfect for those who arrive by subway from DC, wish to shop the boutiques and dine along King St., then return to the city via Water Taxi. 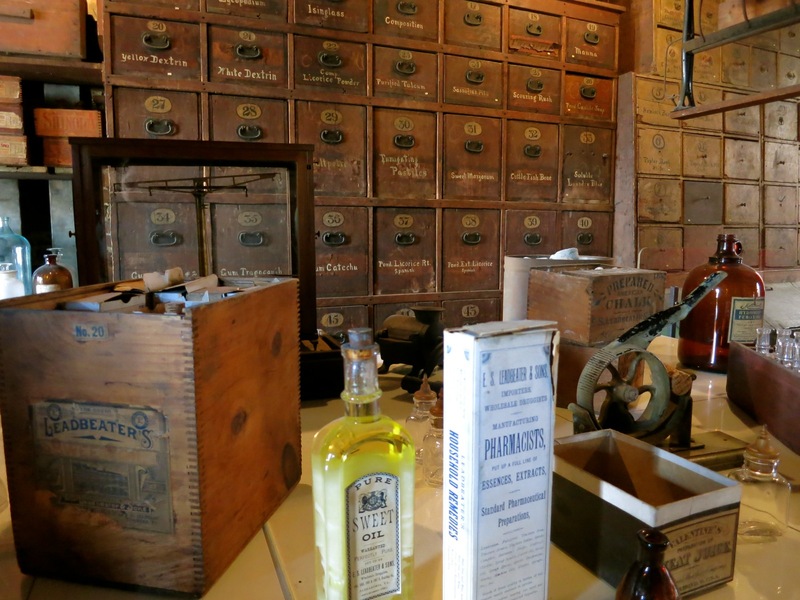 TOUR: The Stabler-Leadbeater Apothecary Museum. 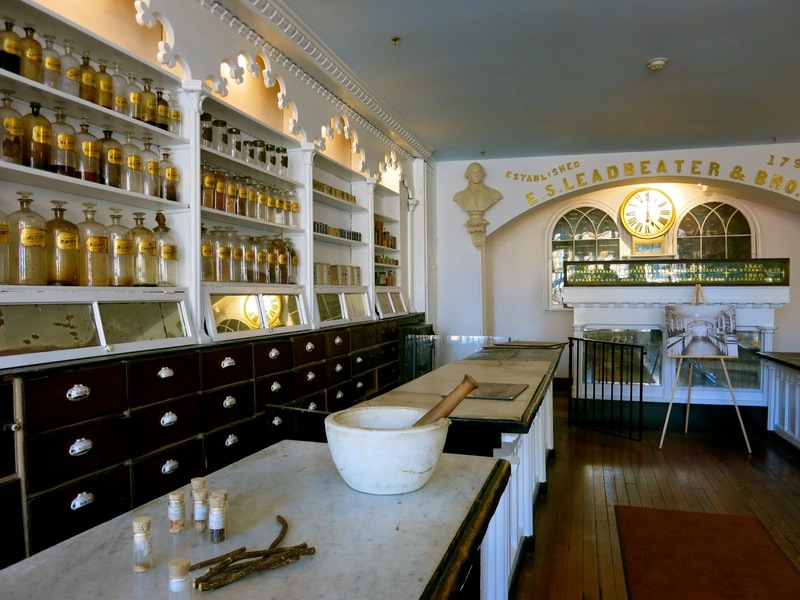 “The only difference between medicine and poison is the dose,” you’ll discover, on an entertaining and informative 45-minute tour of the pharmacy that served both Martha Washington and Robert E. Lee. Opened in 1792 (and moved to this building in 1805), E.S. Leadbeater sold drugs, paints, and sundries – even throughout the Civil War. Considered the “Oldest Best Preserved Pharmacy Post Revolutionary War,” 99% of what you see on the shelves and in storage was what was left here when it closed in 1933. 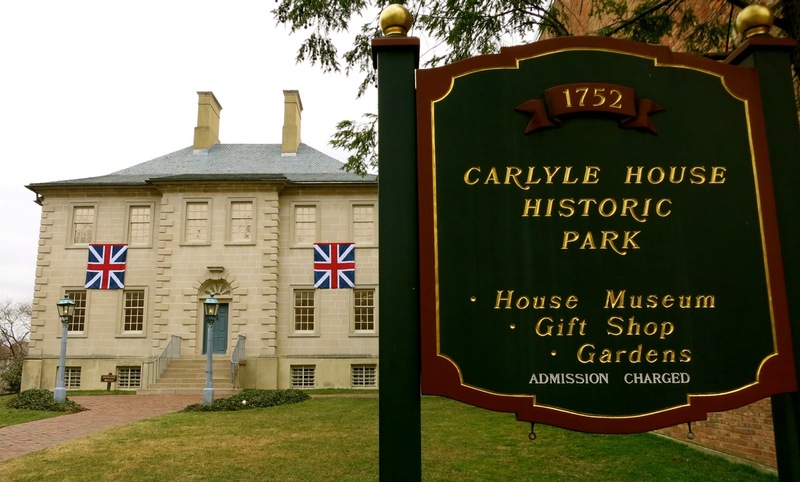 TOUR: The Carlyle House Historic Park. Not to be confused with the Carlyle House Luxury Condos, this 1751 home of wealthy merchant, John Carlyle, was discovered – like Angkor Wat in the midst of the Cambodian jungle – to be an intact, free standing home when apartments around it were demolished in the mid 1970’s. It now has the distinction of being the only 18th century Palladian-style stone house in Alexandria. Though John’s life was marked by death – of his first wife in childbirth, and seven out of eight children – the house was often full of life.In 1755, Edward Braddock, commander of the American-British Army, met here with Governors of five Colonies to discuss strategies for the French and Indian War. And, as George and Martha Washington were personal friends who dined here often, Martha felt close enough to ask the Carlyle’s to borrow their harpsichord (replica on display) so that the Washington daughters could learn to play. $5 for a one hour guided tour, open Tues-Sat 10-4, Sun. 12-4. Carlyle House was also the site of Mansion House Hospital, a medical facility during the Civil War that inspired the PBS series, Mercy Street. 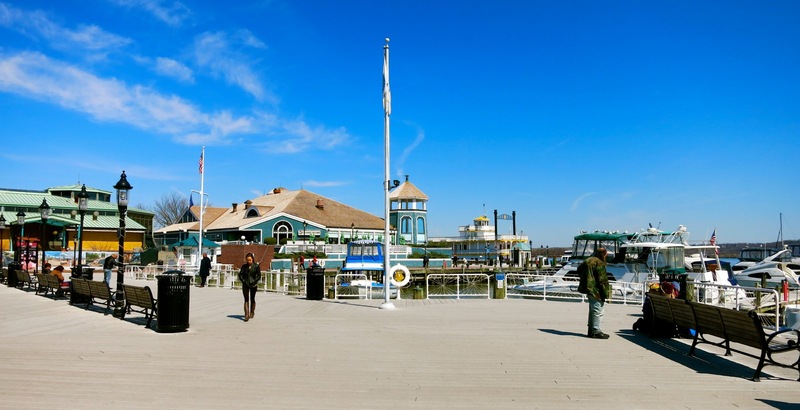 Alexandria is beefing up its Mercy Street connection by running tours, exhibits and events that tie in with the show. Check what’s going on here. DO: Take your dog on a walk around town. Alexandria is one of the dog-friendliest cities in the USA. Most shops place water-bowls outside the front door and some even sport “treat boxes.” Local pups have their favorite daily stops. The Monaco Hotel instituted a Doggie Happy Hour every Tuesday from April to October, culminating in a Pet Halloween Costume Contest. And one of the river cruise companies offers a monthly “Canine Cruise” in the summer. PHOTO OP: Captain’s Row. 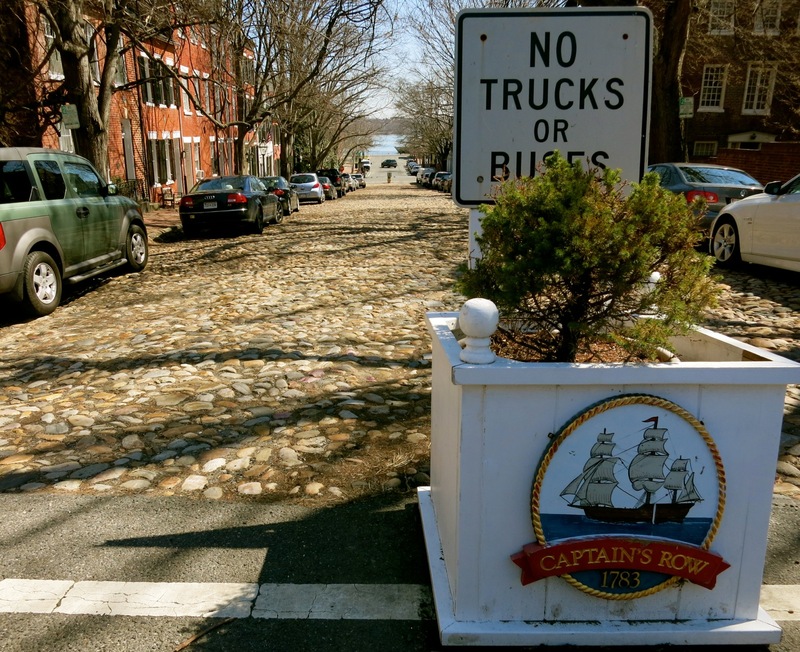 One of the oldest cobblestone streets in the county and part of the third oldest locally designated Historic District, Captain’s Row is a favorite of engagement and wedding photographers. PHOTO OP: The Skinny, aka Spite, House. Just 7 feet wide, this much photographed home was built in 1830 to thwart trespassers from using a narrow alleyway between two homes on Queen St. It’s one of the skinniest homes in the country. 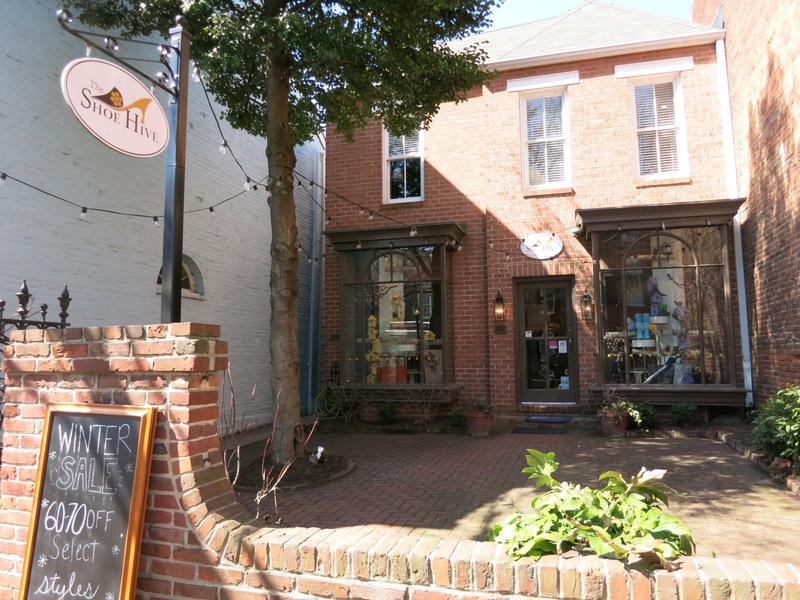 VISIT: Del Ray Section of Alexandria. This is the “funky, “SoHo” counterpoint to more traditional King St. in Old Town. 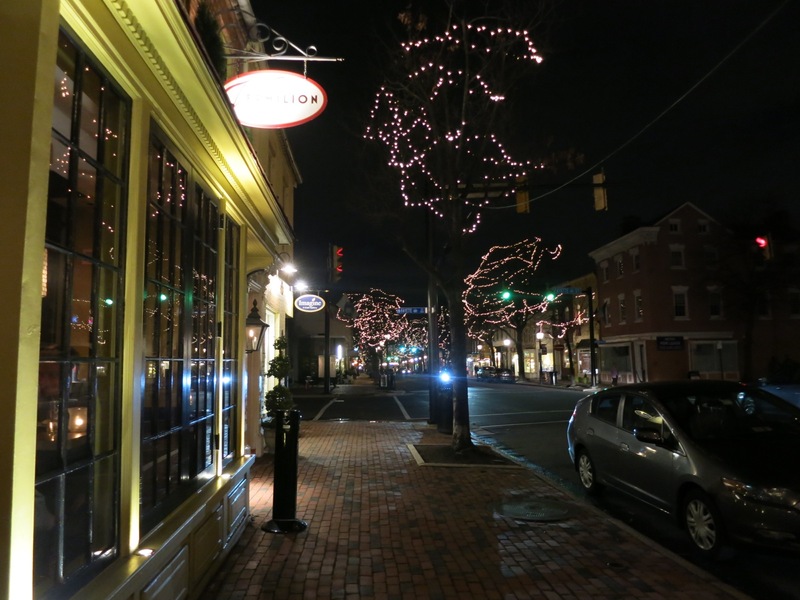 Stroll down Mount Vernon Ave. From butcher shop “Let’s Meat on the Avenue” to “Neighborhood Pharmacy” to “Greener Cleaner” it’s a great way to see a part of Alexandria that many people don’t experience. Plus, there’s Food & Wine Magazine darling, Cheesetique (see below under Where to Eat). VISIT: Alexandria Waterfront. There’s a waterfront renaissance afoot, and it’s worth an afternoon or more to explore the Potomac River from here. You’ll find Water Taxis that sweep you right over to the National Mall (Tidal Basin) in 25 minutes, a waterfront market that includes local beer from the very popular Port City Brewing Co., and themed Boat Cruises. (One – the “Baseball Boat” takes you directly to National Stadium. Just park in Old Town and jump aboard). This is also where The Torpedo Factory is located (see below). 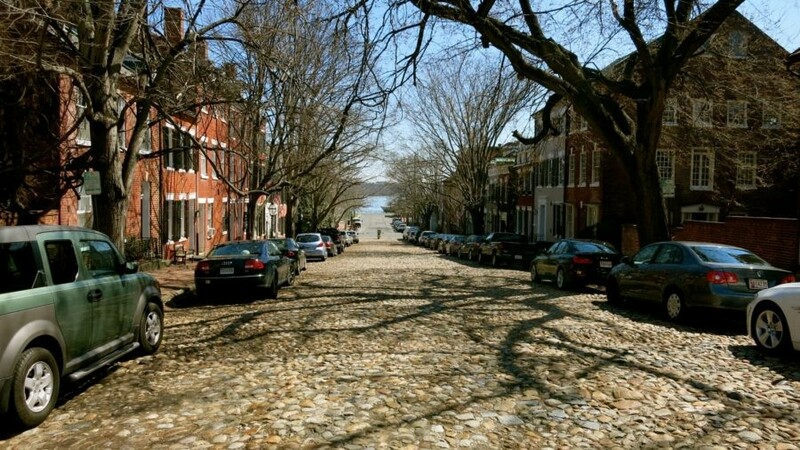 TOURS: Old Town Alexandria Food Tour, Ghost and Graveyard Tour. History goes down easier with a bit of food, drink, or…fright. 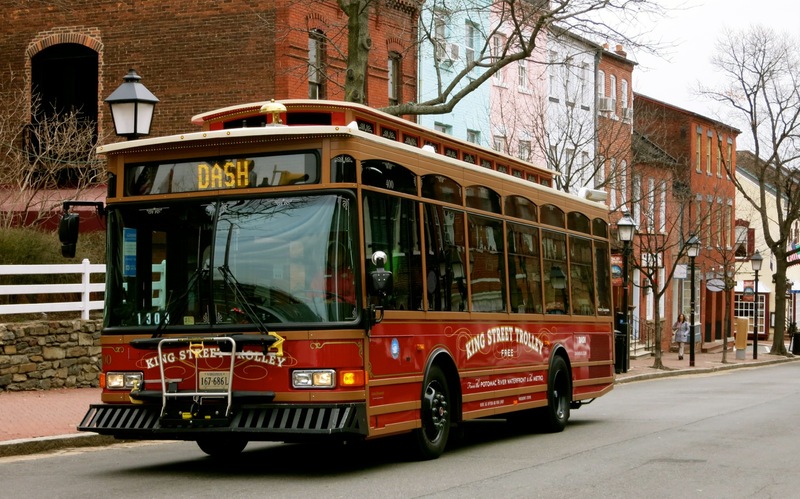 These two popular tours are the best way to access the highlights of Old Town. And the beauty is – you can do both in a day. Food Tours Thurs-Sun 1-4:30, $60 per person. Ghost tours Fri/Sat 7:30 and 9pm, Sun 7:30. Summer on Wed and Thurs as well, $15 adults, $7 kids. 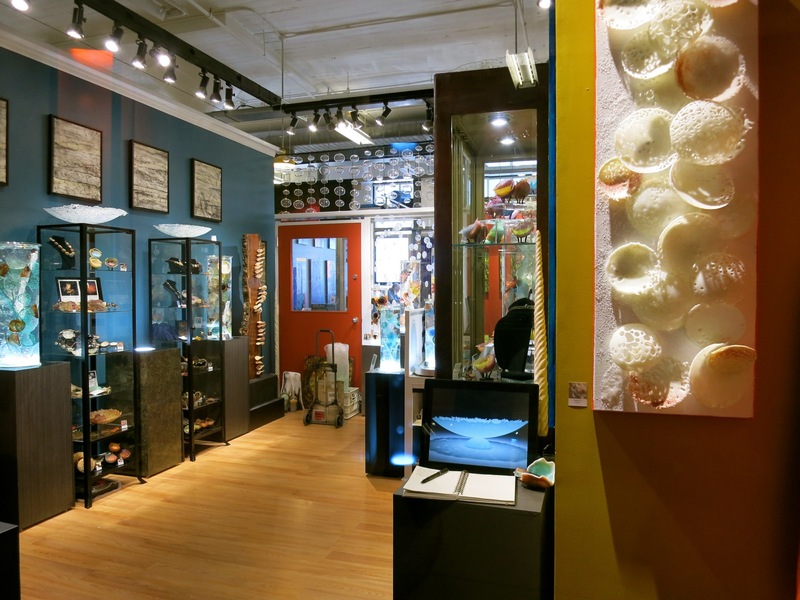 SHOP: Torpedo Factory Art Center. Built in 1919 to manufacture torpedoes, this repurposed three-story building now houses 160 artists in 82 studios and galleries. It’s well worth an hour or two to engage with and purchase directly from glass, textile, paper-mache, yarn, metal and ceramic artists as well as painters and photographers in the very place they create. The Alexandria Archeology Museum can be found on the third floor. Open 10-6 daily, Thurs till 9pm, free. SHOP: There are a few dozen shops within the Old Town Boutique District, and even if you’re not prone to buy, windows entice you in. 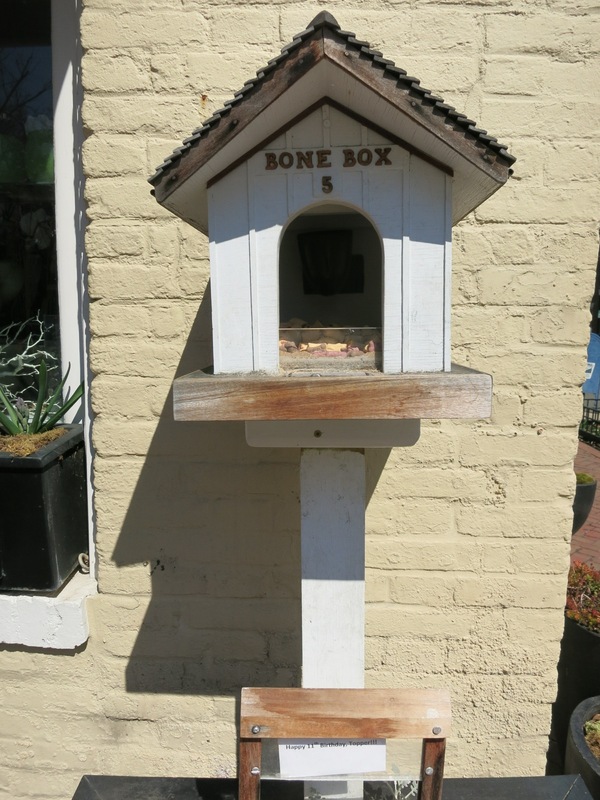 The Shoe Hive was voted “Best Boutique in Alexandria,” next door, the Enchanted Florist generously offers treats in a Bone Box for dogs. SHOP: The Hour Cocktail Collection. Thirsting to bring back the elegance and style of the cocktail hour, The Hour appeals to Art Deco and Mid-Century-Modern aficianados with a flair for entertaining. Ninety percent of what’s displayed on two floors is vintage from the 1920’s to ‘70’s with some bar tools and bitters thrown in. 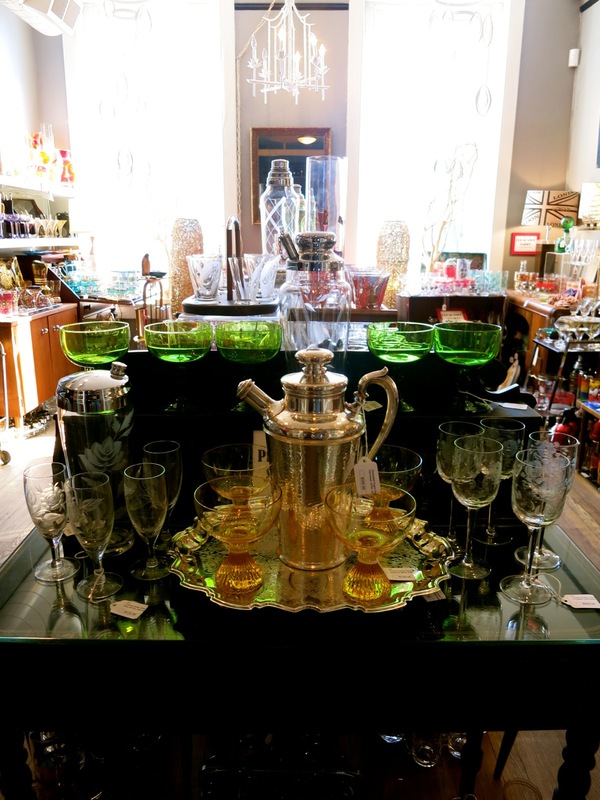 Owner Victoria Vergason has been collecting bar glassware sets for 27 years, amassing a whopping number of frosted, etched and far-out assemblages: it’s a sparking feast for the eyes. Most intact vintage sets (e.g. 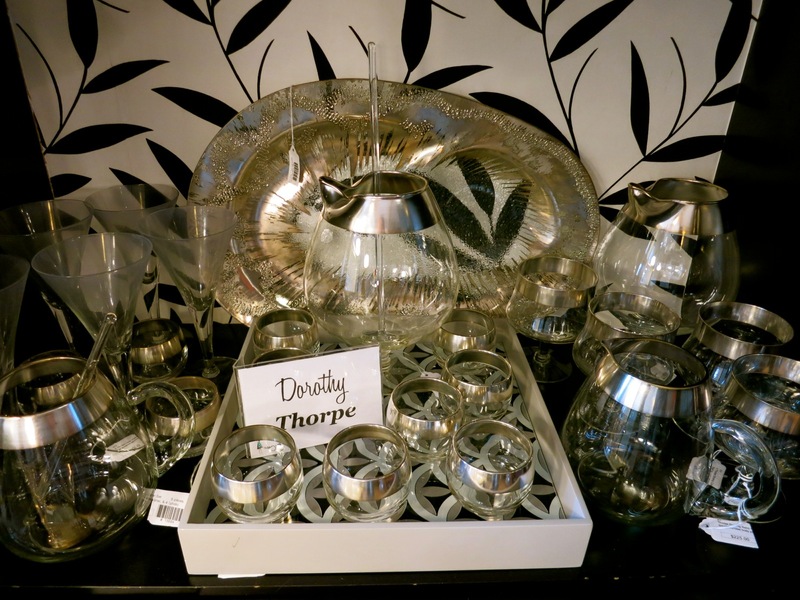 Dorothy Thorpe iconic glassware featured on Mad Men), are in the $350-$450 range. A frosted Scotch and Rye Decanter set with sterling silver overlay is $900, and you’ll find plenty more both in the shop, online, and in several Neiman Marcus pop-up boutiques around the country. It’s the perfect wedding gift for craft-cocktail lovin’ friends. EAT: Vermilion. I love a good restaurant with a community service component. This sweet, pretty, low-lit place was the Obama’s choice for a Valentine’s Day dinner, and yes, the food is fresh, innovative and delicious. But Vermillion is also affiliated with non-profit Arcadia Farm in Fairfax County which delivers food to underserved communities and is teaching farming skills to veterans. Chef Will Morris turns out delicacies like Line Caught Fluke ($32), Local Beef Sirloin ($34), the mouthwatering Poppy Seed Ricotta Fritters ($9) and a gorgeously plated and tasty Beet Salad on a swoosh of Vegetable Ash. EAT: Virtue Feed and Grain. I’m a sucker for repurposed industrial or warehouse spaces, especially if said space turns out decent vittles. 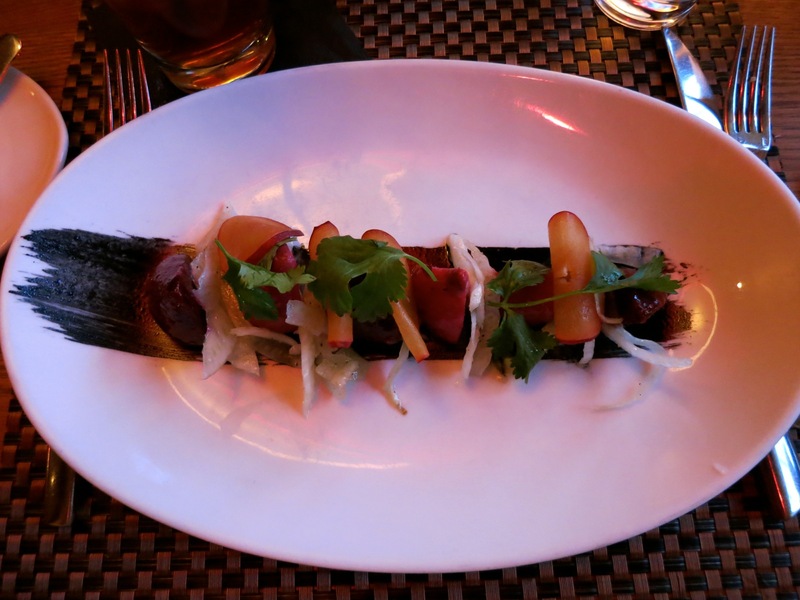 Virtue, housed yes, in an old feed and grain warehouse, features eclectic locally sourced fare. You can’t go wrong with Guacamole Humus ($7), Smoked Gouda and Prosciutto Mac and Cheese, or Bison Burger with Goat Cheese ($16), made from buffalo a few miles away. 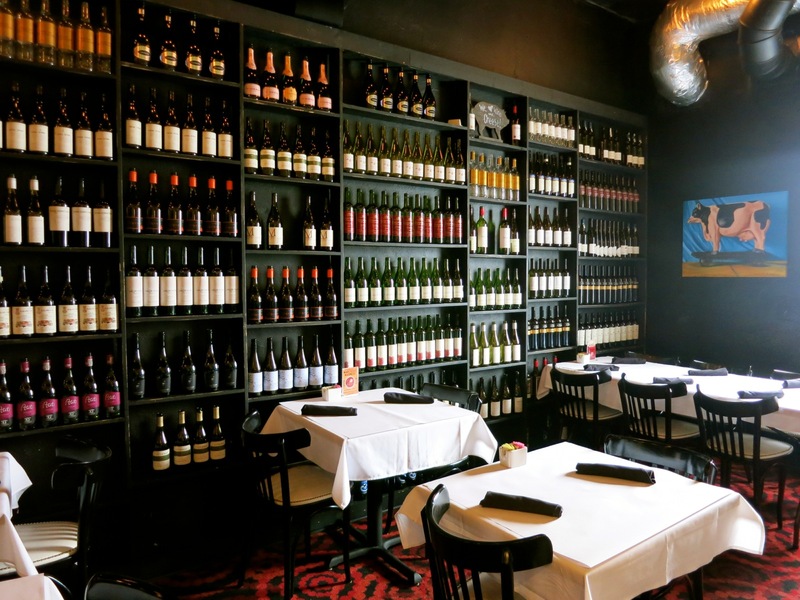 EAT/DRINK: Cheesetique (in Del Ray). You can conceivably try all 250 cheeses (and specialty meats) at “Northern Virginia’s Best Cheese Shop” (Northern VA Magazine), a “food lover’s paradise” (Washingtonian), but do restrict yourself to a selection that changes weekly. And pair each firm, fresh, bloomy, stinky or blue slice up with wine or beer for “The Perfect Pair” ($25 for 5 pairings). 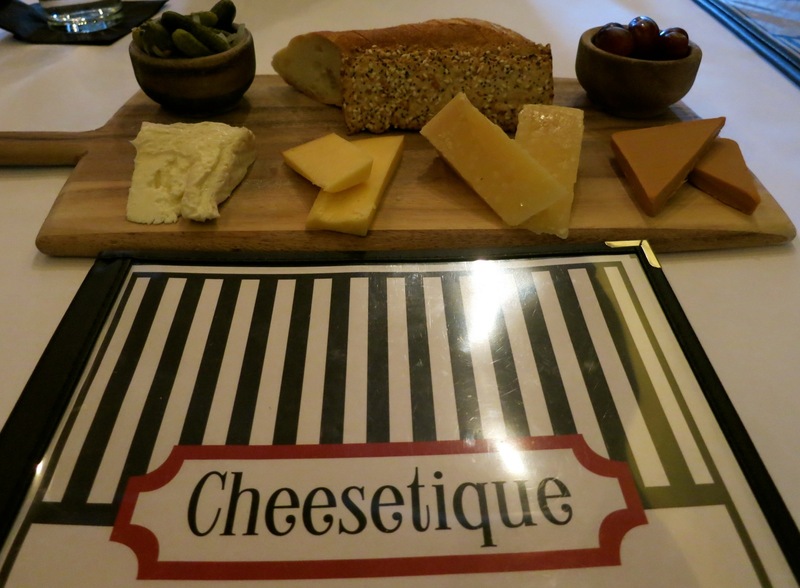 Owned by former software developer, Jill Erber, who obviously veered off on a very different career path, Cheesetique is a destination cheese shop/ restaurant for District diners in the know. Food and Wine Magazine named the Mac and Cheese one of the Best in the USA in 2012, and the accolades keep coming. EAT: Locals also swarm to: Eamonn’s – “World Class” Fish and Chips. And only fish and chips: A fan favorite hole in the wall on King St. Colorful plastic magnetic letters are employed at Misha’s Coffee to announce the daily specials. DRINK: Mason Social. 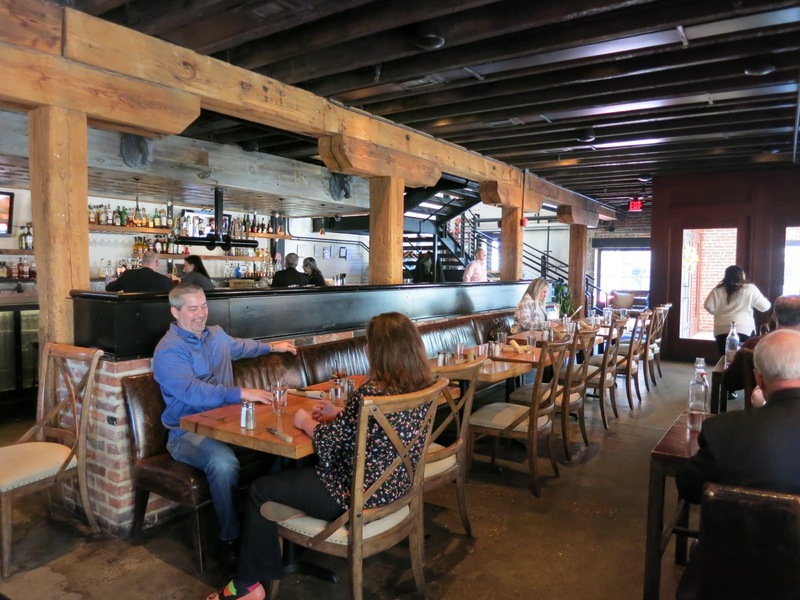 Off the main drag in a quickly developing area of Alexandria (near Potomac Yards), Mason Social opened in early 2015, and touts itself as a “neighborhood bar.” It’s so welcoming; some locals have been coming in five nights a week. 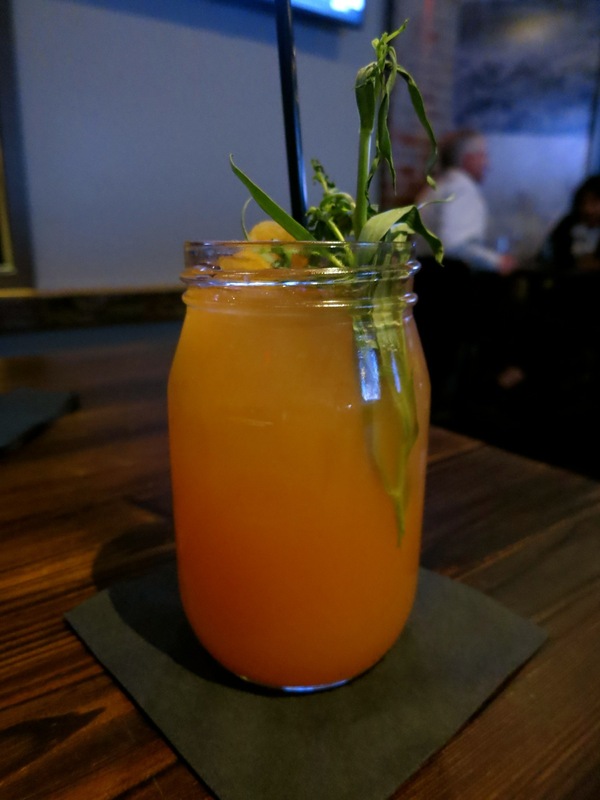 Known for cocktails like the refreshing “Mason Punch” (vodka, tarragon, grapefruit, honey), Taylor Made (hibiscus infused gin, lemon), and The Parker Grey (Earl Grey Tea, Rye), Mason Social – cool industrial meets contemporary farmhouse – is perking up this section of Old Town. DRINK: Port City Brewing Co. – the oldest brewery in the DC area and worth a tour and a very reasonably priced pint. STAY: Hotel Monaco Alexandria. This location has always been an inn, ever since the 1850’s when Confederate-friendly Marshall House stood on site, flying the Southern Cross proudly from its roof. (Legend has it that the owner wanted to stick it to Abe Lincoln, who “could see the flag from the White House.” Union officers came to take the flag down, and in the process killed the inn’s owner but not before he shot and killed one of them. This was considered one of the first – if not the first – volleys in the Civil War). Since then, the building was a Holiday Inn, and eight years ago, renovated and redesigned as the current pet-friendly Kimpton Hotel. 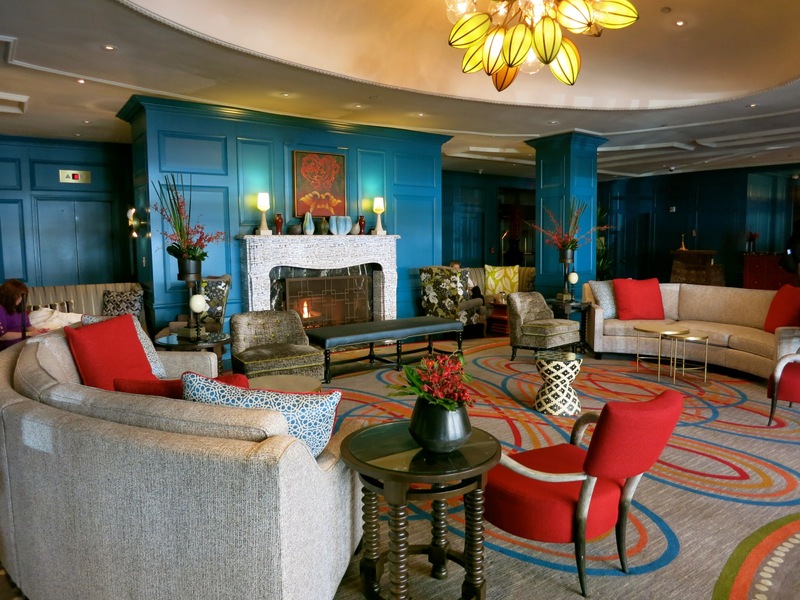 Enter the lobby to find a mélange of tweeds, teal, reds and eclectic furniture that works in the whimsical way Kimpton has with design. Bring your dog (any size), and Charlie – the furry “Director of Pet Relations” – will make him/her feel at home. 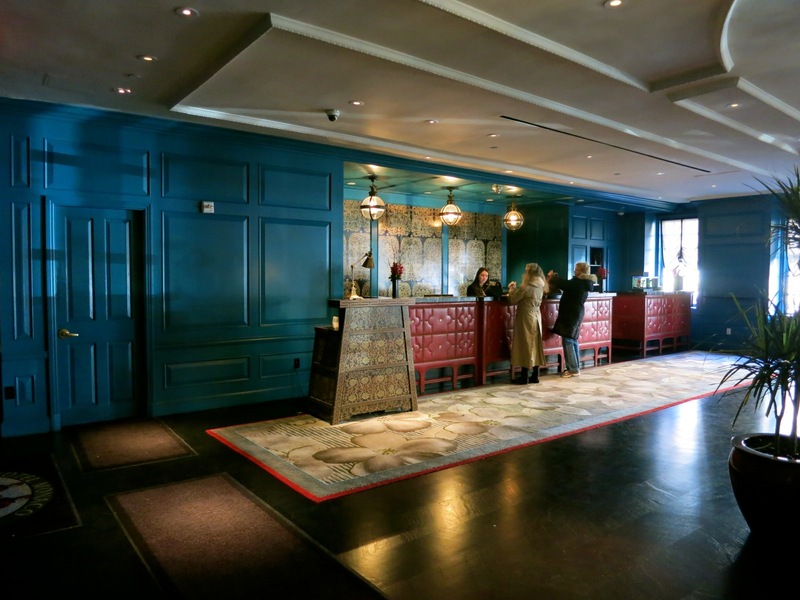 Compared to the lobby, rooms are relatively subdued, though of course Kimpton-fanciful. On your way, you’ll find emblems woven into the hallway carpeting – reproductions of both Confederate and Union uniform buttons. Each eye-catching room sports gas-lantern wallpaper, black and white print setees punched by red Cardinals and high-end bathrooms. Bedding, naturally, is downy-dreamy. 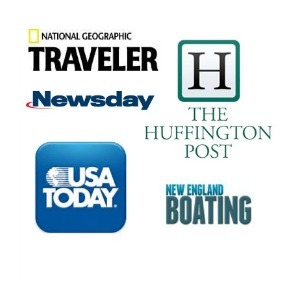 Rates from $149 per night. 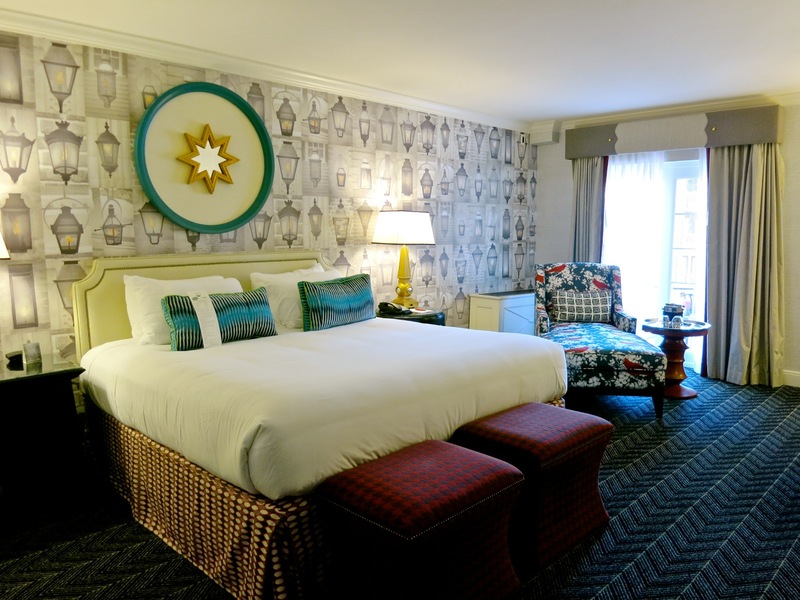 STAY: There are two other boutique hotels in town – both Kimptons – and both with the quirky, exemplary service that brand is known for. The Federal style Morrison House, with only 42 rooms, has won awards for design and service. The more contemporary Lorien Hotel and Spa is on King St. right by the Metro Stop.